Smurfs is coming to town! Yes, The Smurfs in 3D is coming to town this September 2011! "The story-lines tend to be simple tales of bold adventure. The cast has a simple structure as well: almost all the characters look essentially alike — mostly male, very short (3 apples high), with blue skin, white trousers with a hole for their short tails, white hat in the style of a Phrygian cap and sometimes some additional accessory that identifies a personality. (For example, Handy Smurf wears overalls instead of the standard trousers, a brimmed hat, and a pencil above his ear). Smurfs can walk and run, but often move by skipping on both feet. They love to eat sarsaparilla (a species of Smilax) leaves, whose berries the Smurfs naturally call "smurfberries" (the smurfberries appear only in the cartoon; in the original comics, the Smurfs only eat the leaves from the sarsaparilla). Smurfs are almost never seen without their traditional white hat on, but the few exceptions suggest that Smurfs are bald, with the exception of Smurfette and later Sassette. The Smurfs fulfill simple archetypes of everyday people, ie the Grouchy Smurf, Gutsy Smurf, Brainy Smurf, Papa Smurf, Clumsy Smurf and of course the Smurfette." However, this time around, The Smurf were chased out by the evil wizard Gargamel out of their village, they're forced through a portal, out of their world into ours, landing in the middle of New York's Central Park! Just three apples high and stuck in the Big Apple, the Smurfs now must find a way back to their village before Gargamel the evil wizard tracks the down! Now who is going to bring them back to their village? Who? Is it going to be Grouchy Smurf, Gutsy Smurf, Brainy Smurf, Papa Smurf, Clumsy Smurf, or Smurfette? My favorite Smurf of all would be Papa Smurf, hence of course Papa Smurf would find a way to bring them out! 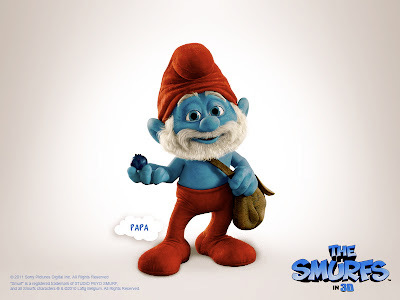 Papa Smurf is the third-oldest Smurf (after Grandpa and Nanny Smurf) at the aged of 542. However, he is still quite energetic for his age. Papa Smurf is easily distinguished from the other Smurfs by his red clothes and his bushy white beard. He is a gentle, wise and a knowledgeable village elder. He serves as the Smurfs' leader and serves as a paternal figure to whom the Smurfs usually go to when they require counsel. Papa Smurf is always concerned about the Smurf's well being and harmony. 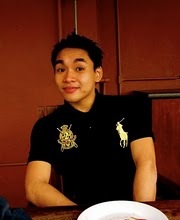 He is a very altruistic Smurf and are always ready to help somebody. Papa Smurf also has diplomatic skills in case the Smurfs meet humans or other creatures. He usually manages to speak without replacing nouns and verbs with the word "smurf" as other Smurfs do. As one of the leader, Papa Smurf would of course try to use whatever resources that he has in New York City! But what kind of resources that Papa Smurf would have in an odd city of them, which is the New York City?! The resources that Papa Smurf would have which is of course the other Smurfs, which is Grouchy Smurf, Gutsy Smurf, Brainy Smurf, Clumsy Smurf,and of course Smurfette! So by having Papa Smurf as their awesome leader, and with the quality of wise, gentle and knowledgeable material, he could just use whatever sources he has, which is The Smurfs to just bring them back to their Smurfs' village! Oh well, do check out the trailer! My daughter and I went to see The Smurfs a few weeks ago and to be frank I had the most laughs with the cat! He was just cracking me up!!! I really like The Smurf.Its complete entertainment package.It has comedy and adventure.I like the character of Papa smurf.Its fun movie to watch with friends and family.It has sweet and simple story.Must watch movie.